Rotorua Stamps and Coins has an extensive range of Philatelic and Numismatic collectables to select for purchase. We are conveniently located in the centre of Rotorua city, a major tourist destination in the central North Island of New Zealand. and fair. Whether you like to collect for fun, or for a specialised collection, we cater to everyones needs. Please refer to our Contact page for information of where we are, and how to get a hold of us. Included is a link to my listings on TradeMe which are comprehensive. We do seek to buy Philatelic and Numismatic items or collections. Specialist Advice : Professional knowledge and expertise in regards to Philatelic and Numismatic collectables. Valuations : Expertise services for insurance purposes or selling. Postal Sales : Mail order service nationally and internationally. Rotorua Stamps and Coins is a reputable business that specialises in Philatelic and Numismatic collectables. Lois Ion is the director of this business, having extensive 40+ years experience and knowledge gleaned from working with her father Donald Ion, who has been a Philatelic and Numismatic dealer for over 60 years. 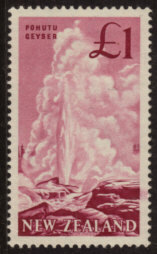 The 'Ion' name is known to many Philatelic and Numismatic collectors nationally and internationally. Lois feels that this solid grounding has enabled her to be able to look after her clients interests and deliver what they need, which she loves to do. Her shop has a relaxed and comfortable atmosphere that is welcoming, and she extends a offer to you to come in for a browse and cuppa. and Ngaiterangi iwi - three major Maori tribes in the Eastern and Bay of Plenty region. Since 2004 Lois has advised and assisted iwi (tribes) and Maori designers on collectable items with Maori Art themes, which were officially released by the New Zealand Reserve Bank and New Zealand Post. 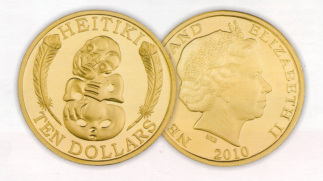 The 2004 Pukaki, 2010 Heitiki and 2012 Heimatau gold coins are now considered to be amongst the rarest modern coins today. 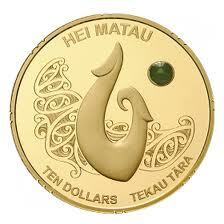 Nationally and internationally these coins are highly sought after. Lois enjoys working with New Zealand Post and the Maori designers to ensure that her clients both nationally and internationally have an opportunity to obtain these scarce items. Please read my Blog for more information about these coins.